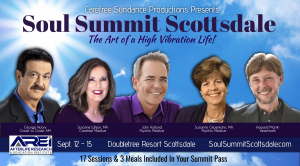 This special evening is Open to the Public and separate from your Soul Summit Scottsdale Pass! 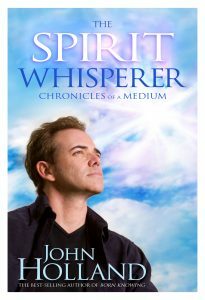 During this special evening, John will present a fascinating insight into how a medium connects with Spirit to bring healing messages of hope, love, and inspiration. John will explain how our loved ones on the Other-Side continually try to send us signs and symbols to let us know they’re still connected to us. He’ll also explain how you can have your own personal connections. John will spend the majority of the evening giving as many messages as possible. $49, $59 for preferred seating, first 3 rows until sold out! 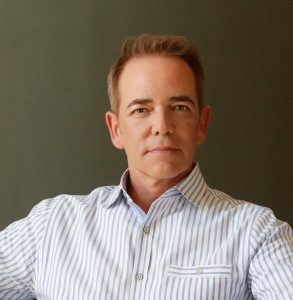 John Holland – Internationally renowned psychic medium, spiritual teacher, author, and radio host. His public demonstrations provide audiences with a rare glimpse into the fascinating subject of mediumship, which he delivers in his own unique style, explaining the delicate process of raising his own vibrational energy to link with the Other-Side and deliver messages, which he does with clarity, passion and the utmost integrity. John has spent a significant part of his life developing his abilities, and spent two intensive years studying in the UK, where he got the thorough grounding and training to become one of the most sought after professional mediums on the world stage today! He has starred in several TV specials, including A&E’s “Mediums: We See Dead People,” which provided a fascinating insight into how John works as a Psychic Time Machine, where he’s able to pick up vibrations and detailed information, whether it’s seen, felt, or heard from a past event. He also starred in his own pilot “Psychic History” for the History Channel. He is the author of the best sellers: Power of the Soul, Psychic Navigator, Born Knowing, The Psychic Tarot Oracle Deck, The Spirit Whisperer – Chronicles of a Medium, The Psychic Tarot For The Heart and his latest deck The Spirit Messages – The Daily Guidance Oracle Deck as well as 5 Apps and numerous online workshops based on his signature workshop series. 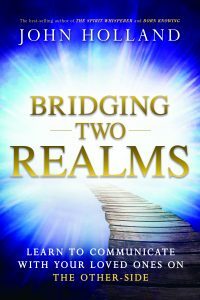 Bridging Two Realms: An Evening of Spirit Messages with John Holland! Choose from general or preferred seating until sold out! 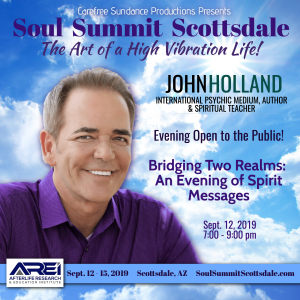 September 12 – 15, where John Holland will also present during our dinner gala event with George Noory, Coast to Coast AM, included in your Summit Pass! Learn the Art of a High Vibration Life!